We’re still here in Toul having our new diesel heating system installed before we head on again for Paris. 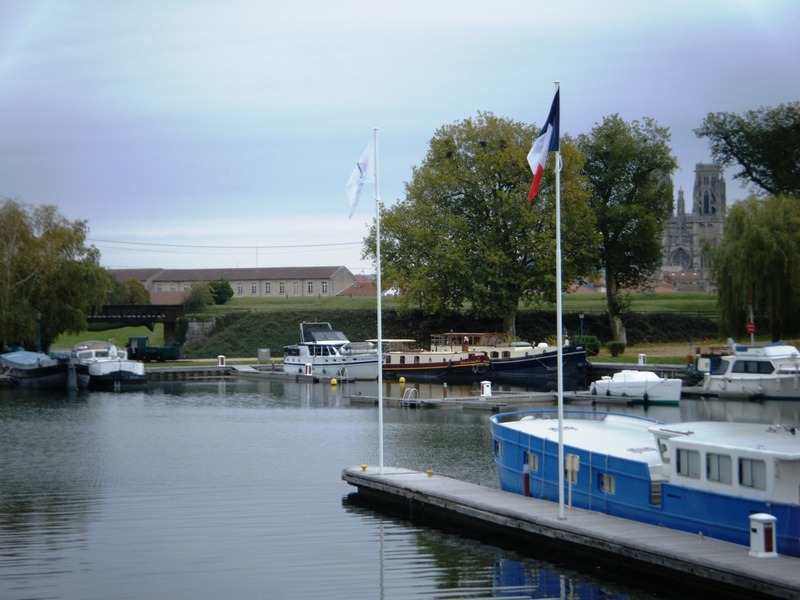 Here we are moored very happily, with lovely neighbours, in the Port de France, with Toul cathedral behind us (to right through trees). These past few nights have been well below freezing here in port, thankfully we have excellent shore-line electricity so can use our convection heaters .. but heating the water at the same time is a little more than it can cope with. So it’s one or the other! 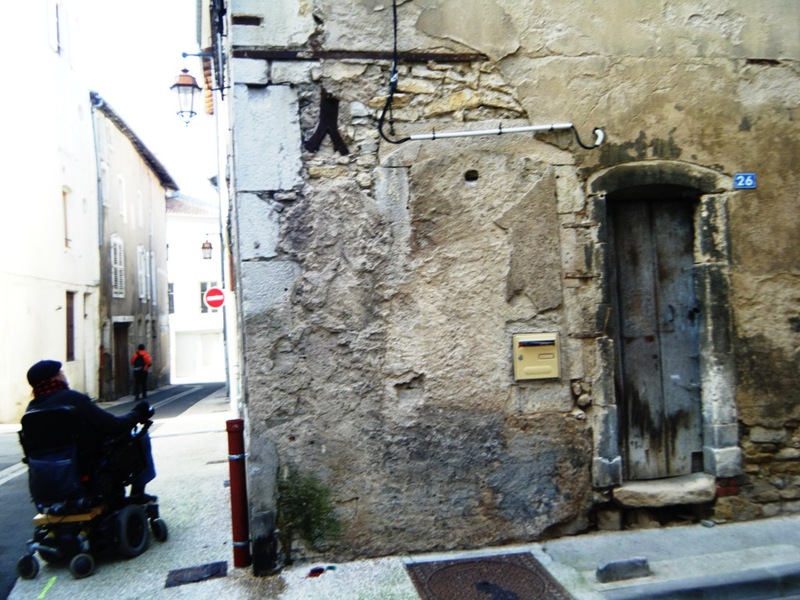 We spend a lot of time wandering the streets, here in Toul, admiring the old buildings, some very tired but totally charming. 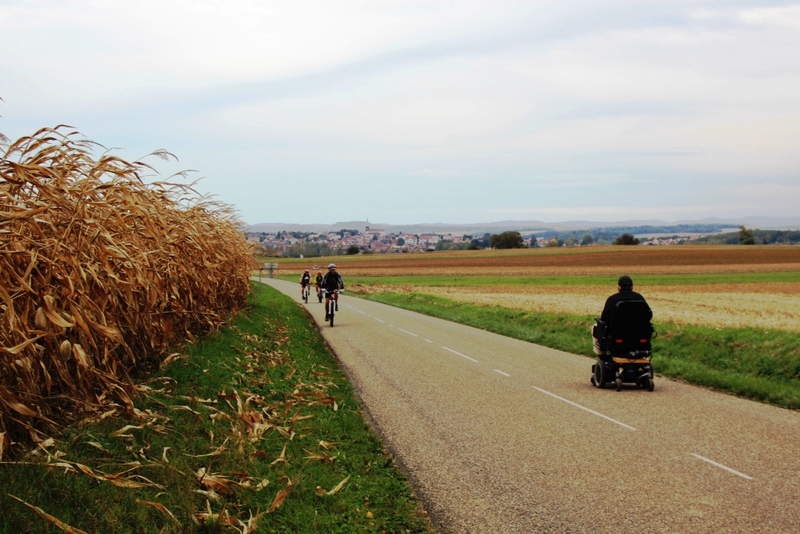 We want to tell you about our time on the Marne au Rhin est (east) from Toul to Strasbourg (see our last blog for the route statistics). Many fellow-boaters had told us what a wonderful stretch of waterway it is and the guidebooks rave about it. So we should not have been surprised at the amount of boats, mostly hired, on this section of water despite being out of season. 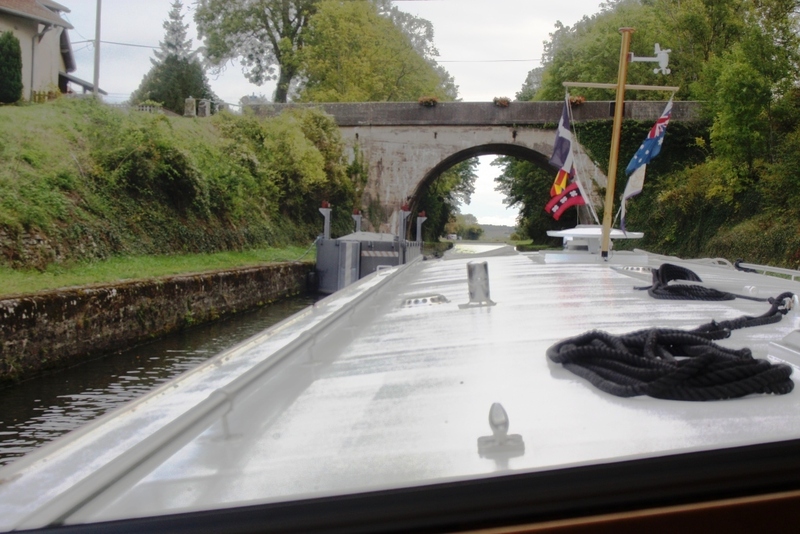 Coming up to yet another lock along the Marne au Rhin canal. 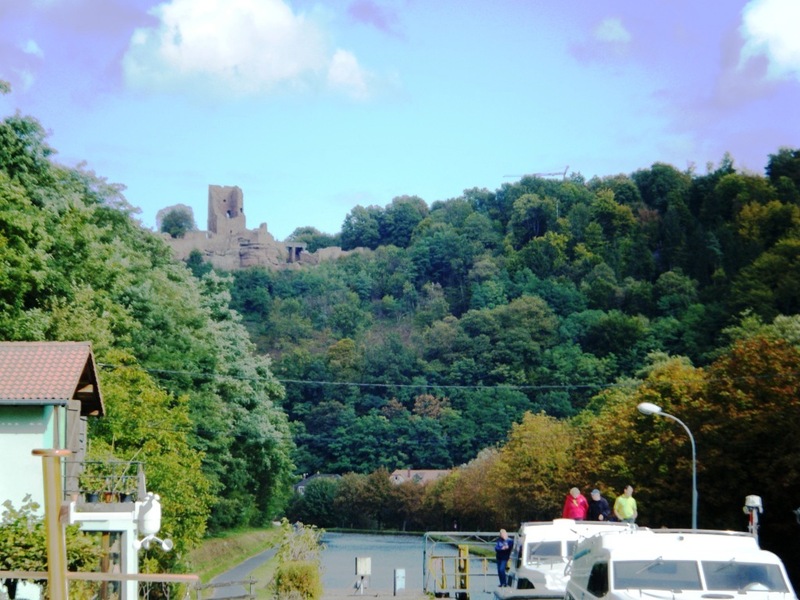 We counted six different hire boat outlets along the 100 kilometres between Lagarde and Strasbourg, and as we progressed along this section it seemed to get busier and busier with amusing groups out for the weekend. Another beautiful sunrise, this time at Lagarde on the Marne au Rhin. We were particularly surprised at how many all-male groups there were, usually six or more on one boat. 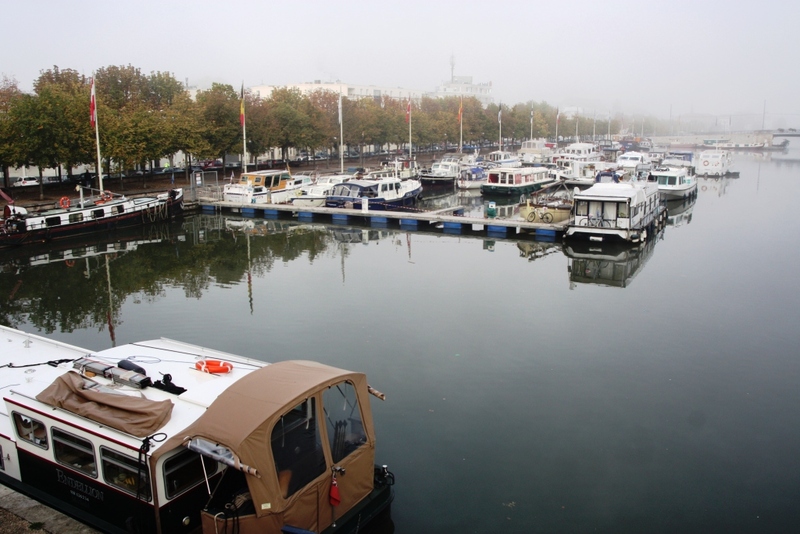 Before arriving in Nancy, coming from the north, we found ourselves following one of these hire boats: A large cruiser especially considering it contained just two people and their dog. This (we found out later) was Gabbi and Heinz with Bobby (a gorgeous Husky/cross dog). 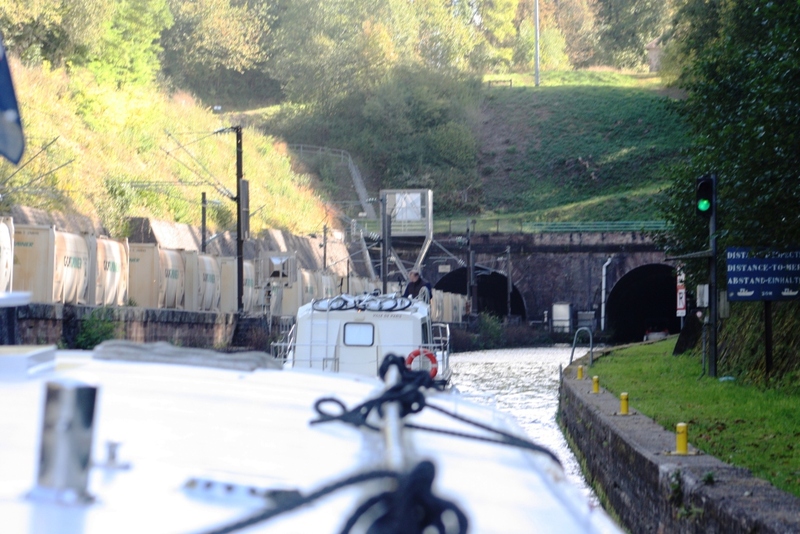 We shared the two locks coming off the Moselle and pottered into Nancy behind them where, as is usually the case, they had to wait for us at the final lift bridge as the bridge operator wanted to open only once to save the traffic disruption. Despite our new engine we are still slower than the ‘plastic’ cruisers and are never in a hurry. Endellion moored at the Port St George in Nancy. 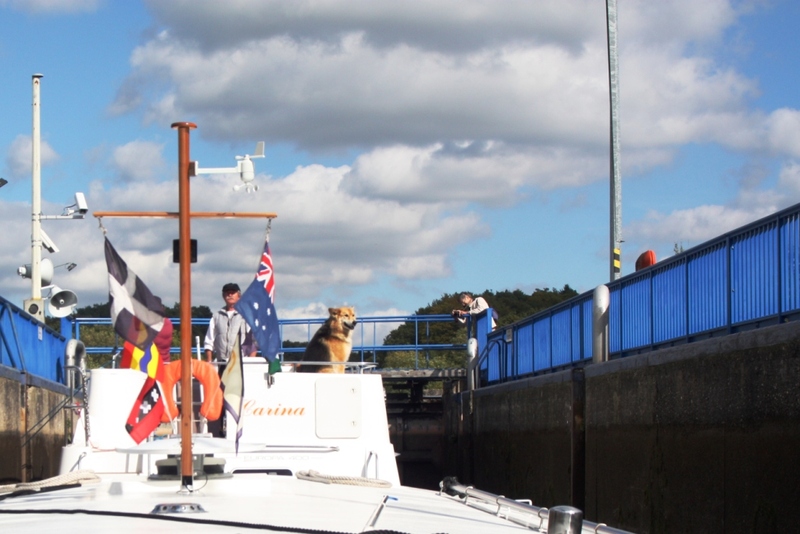 Leaving the lock ahead of us, Gabbi at the wheel, Heinz instructing and Bobby (the dog) navigating. When we left Nancy for Strasbourg, on unfamiliar waters, we were held up at the first of the string of automated locks. Considering the amount of locks we have used there really aren’t many problems but we had a twenty-minute wait for a lock-keeper to arrive. During our wait we recognised the late starters, Heinz and Gabbi who were now hovering behind us also waiting for the lock to work. Finally, once the lock-keeper had sorted out the problem we continued on together. 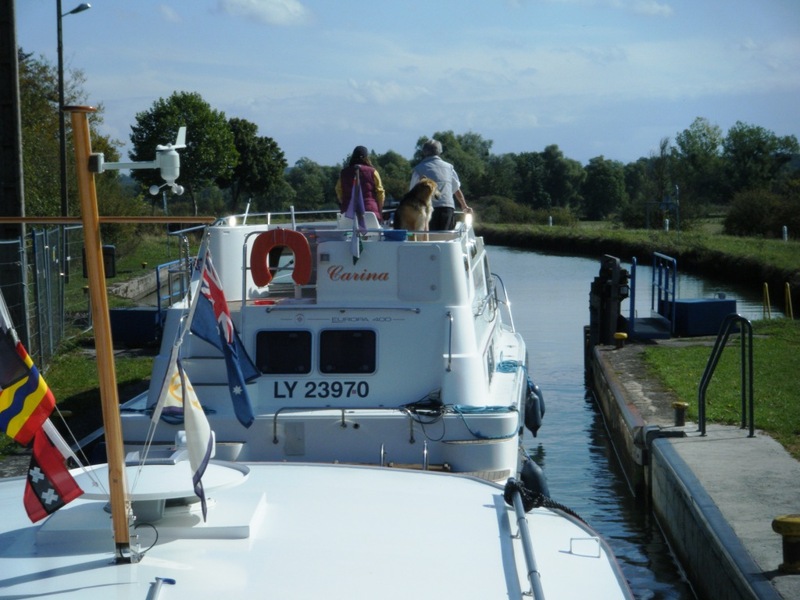 In these smaller locks (30 metres by 5) it was a bit of a squeeze to put two boats of our size together but Heinz and Gabbi were now not in a hurry and enjoyed travelling with us (as we did with them). For the next two days we did 21 locks together. Finally we come to the top of the 15 metre rise in the Rechicourt lock. Note Bobby sitting up for the view at last. 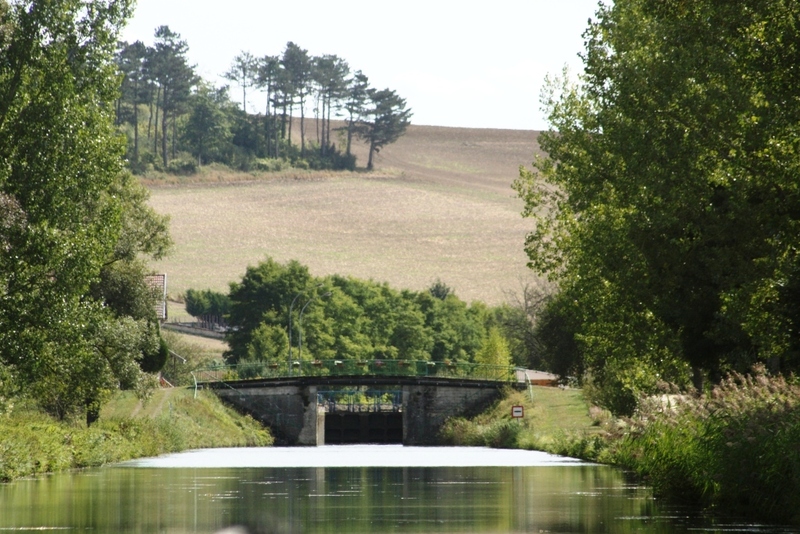 One was the Rechicourt lock, the deepest in France at 15 metres – half-an-hour packed in the lock together was amusing. Even Bobby (their dog) was bored towards the end sitting up, on what seemed to be his own seat, to see beyond the lock walls as we arrived at the top. They had hired boats in this region for many years so knew the waterway well and the restaurants. Stewart tells the story .. Famous singers and musicians around the world have set up successful restaurants and night clubs; Ronnie Scott’s in London, Charlie Bird’s in Washington DC for example. We hardly expected to find one such establishment in far-from-anywhere Xouaxange, population 334 in Alsace France. But we did. 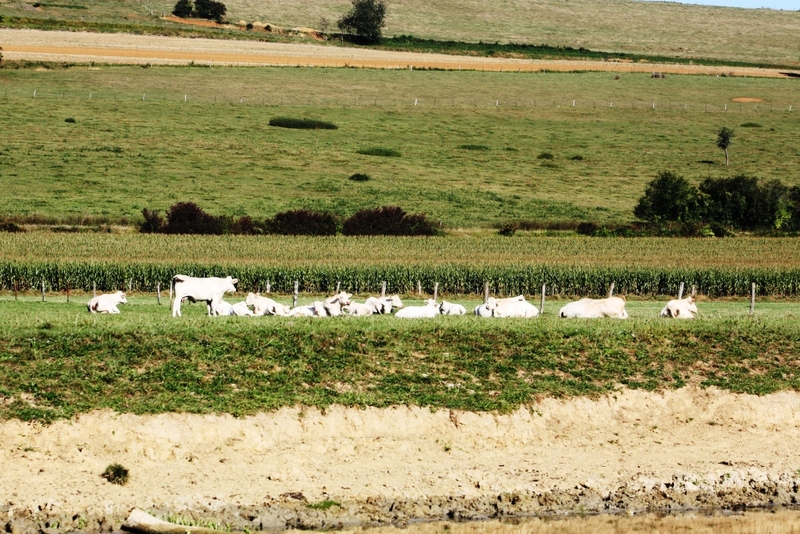 A common sight: white of the Charolais and gold of maize fields. Heinz and Gabbi are huge fans of the lone restaurant in town, Auberge Mesnil , and suggested it for dinner: Never having tasted food from Madagascar we were keen to give it a try. The dishes had an Indian slant and a great night was had, so on our return journey (Strasbourg back to Nancy) we made a return visit. At one end of the restaurant was a large flat screen TV, usually showing some French program. But this night I noticed something quite different; a lithesome young woman was singing in clips in a style similar to Kylie Minogue, but with an almost Caribbean vibe. The hips were swinging, costumes frequently changing, the look at the camera beguiling. I looked at the singer and then at our charming hostess. Could it be the same person?? It seemed possible, so Lesley asked. One of the narrow bridges, leaving Xouaxange after a very good ‘exotic’ meal at the Auberge Mesnil. ‘Yes, it’s me”, she said. How a young woman obviously once very big in far away Madagascar had ended up here in a remote part of France we had no idea! Link here for the restaurant. We left Gabbi and Heinz at Xouaxange and met up with another couple skippering a hire boat over what we learned was the German Unity Day long weekend. Approaching the 2.3 kilometre d’Arziller tunnel with the railway line and trains running alongside us. We were in convoy behind them just before the short Niderviller tunnel (almost half-a-kilometre long) and then the long Arzviller tunnel (almost two-and-a-half kilometres long) and shared the descent in the wonderful inclined plane with them. 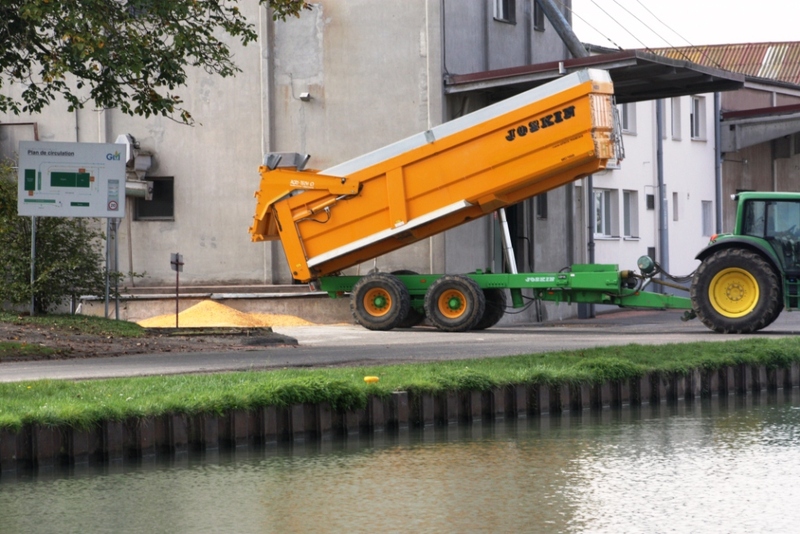 We found an excellent mooring at Lutzelbourg where the town provided free electricity and water. The following day leaving Lutzelbourg at the first lock we met up with this German couple again and travelled the next nine locks together into Saverne. 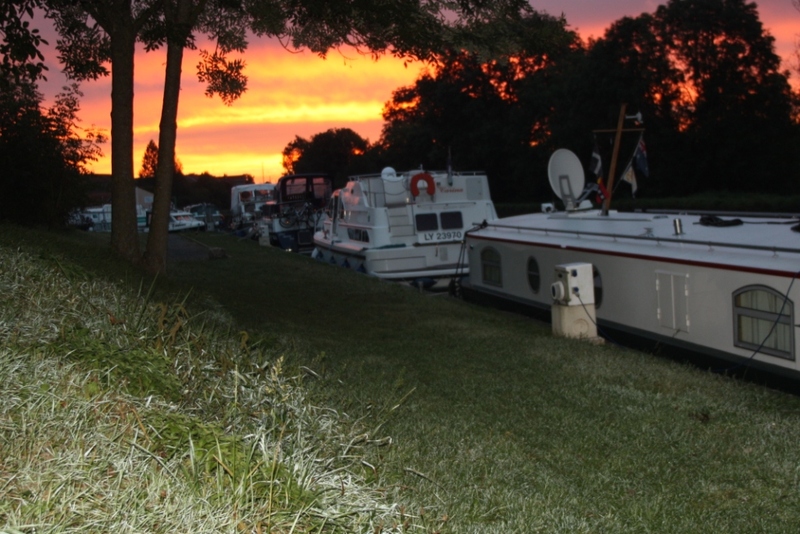 A quiet but lovely mooring in the heart of the town of Lutzelbourg. Looking down from the top of the inclined plane. At first, as they entered the lock behind us, there would be lots of female laughter and a jovial male voice making what seemed to be light of tricky situations. They struggled, with their not easy to manage hire boat, to get the ropes down onto the bollards (we were descending at this section). At first I would hop off Endellion to assist but within a few locks, for the first time, we could see a boat hook being deployed. There are many ruins of castles on the hills along the Marne au Rhin east. They had less and less problems getting tied off safely before we agreed it was time to start the automatic operation when I would pull the lever to instruct the lock to close the gates, empty the lock and open the gates for us to exit. They later told us they had watched me and copied with the boat hook – something we learnt early on in our boating days from Sally and Les. They were great fun.. always laughing and enjoying being out in the cold, wet and windy weather, just like us! At the end of our run of locks together ending in Saverne it was by now very windy. We were extremely lucky to find a great little place to moor although right by the car park where a young family were busy inflating their rubber dinghy. Dad helped with our ropes and I walked along the quay where I recognised the laugh of our travelling companions. They had almost brought their hire boat into a safe mooring and I could help them with the last stage. We said our farewells (their hire boat was now returned to base) and they said thanks to us they had finally learned how to handle it – we’d say thanks to our friend Sally. Chateau Rohan in Saverne, our constant view from the mooring. We were moored adjacent to the fantastic Chateau des Rohan (just see the photos to believe how special it was). Beside us the family of mum, dad and two young ones finally had the dinghy ready to go but they just about had to tie it down as the wind was so strong, so they did just that and left it chained to a post and hopped back in their van and disappeared for a few hours. 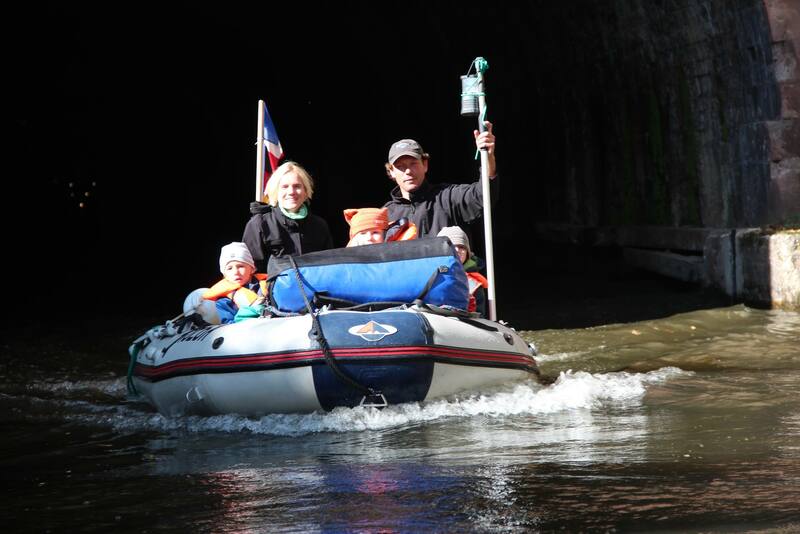 They returned when the sun had come out .. and bravely the four of them squeezed into the tiny inflatable along with camping gear and food containers, sitting up high, children with their life-jackets on and off they headed into the lock. This photo sent to us by the lovely family (here with one extra child on loan from friends also camping) who were inflating their boat beside us at Saverne. They were obviously off for a few days and the next day Stewart left a thank you note on the windscreen of their van although, as there had been pouring rain, I thought they would be very unlikely to find it. But, a week or so later we received an email from them together with a beautiful photo (here). What a lovely encounter. 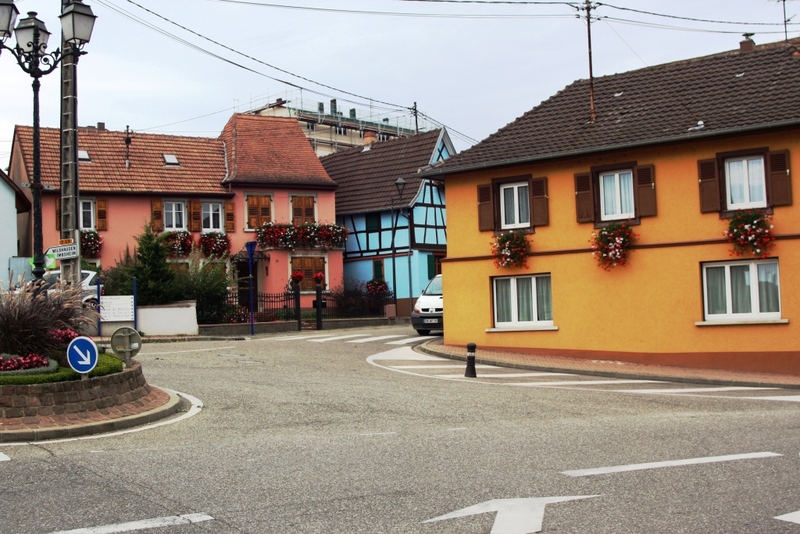 Saverne is heavily promoted in many guide books but to us it was a little bit over-rated. The star was the Chateau des Rohan which was our constant view as we were moored directly across from it. It is a stunner from the mooring although from the main entrance (on the other side of the canal in town) it looks nothing much and we didn’t venture, this time, inside for a tour. Chateau Rohan in Saverne, hard to imagine it before the canal was built, taking away it’s gardens – to our benefit. The Chateau was built in 1779 (after an earlier chateau burnt down) by the bishop of Strasbourg. 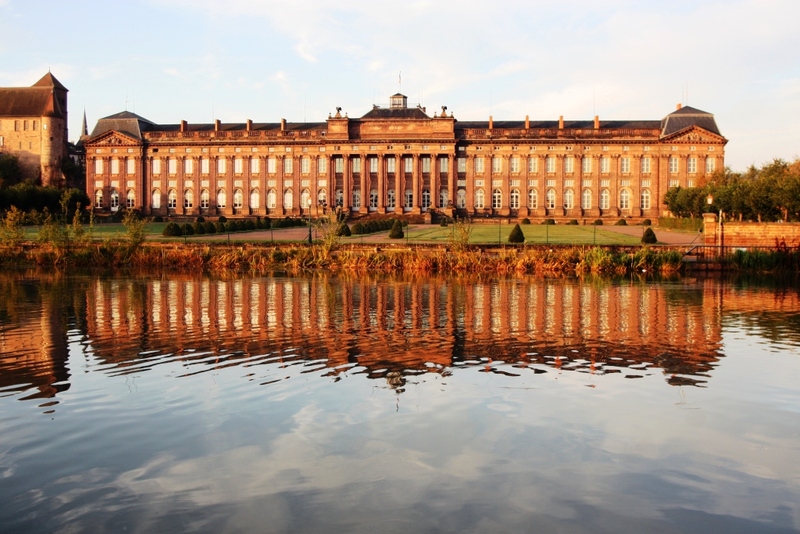 It’s had may lives throughout the centuries: residence of the bishop of Strasbourg, old people’s home for war widows under Napoleon III, jail, barracks from 1871 until 1945. In 1853 the park was dissected and mostly destroyed by the building of the canal we’d just entered town on, ie, the Marne au Rhin. 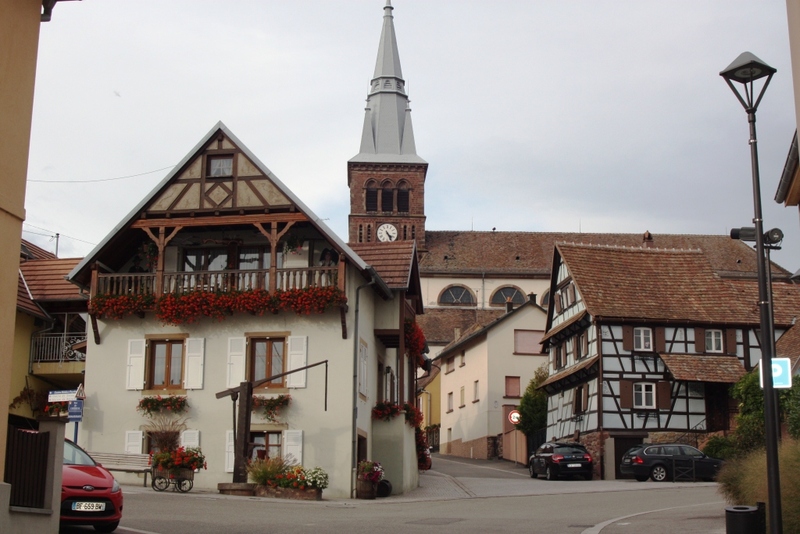 Today it houses a Youth Hostel, the Museum of Saverne and the Espace Rohan (theatre and concert room). Leaving Saverne on our way to Strasbourg we crossed the Alsace plain where our next stop was the town of Hochfelden and the nearby village of Hohfrankenheim. We’re out on one of our ‘field trips’ around the Hohfrankenheim village. We’d read that this section of the canal has many old farms and half-timbered houses dotted around the waterway. Fantastically vibrant colours of the houses in the village of Hohfrankenheim. This was an opportunity for one of our ‘field trips’ as we call them, where we set off pretty much into the unknown with a vague idea of reaching somewhere of interest! Without fail we have a brilliant time on these excursions. 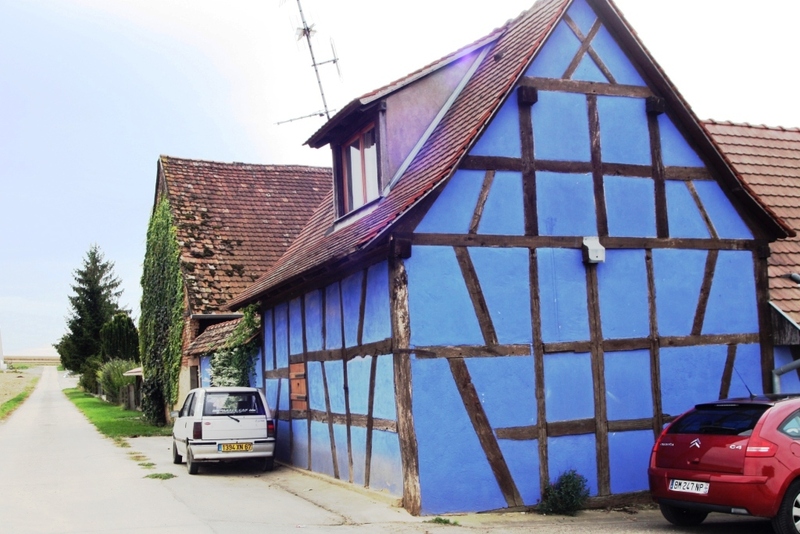 The surprise find of this trip was just how vibrantly coloured the many half-timbered houses were and even at this time of year all the old farmyards were full of flowers even if fading slightly. The bold colours of houses in this region are an amazing sight. The farmers were very busy mostly with the late maize crop now brown and golden in the fields around. Other than the farmers buzzing around it was extremely quiet, we didn’t find one cafe or bar open in this area and this was a Saturday. Wood-framed houses with small verandas remind us of Apline villages. 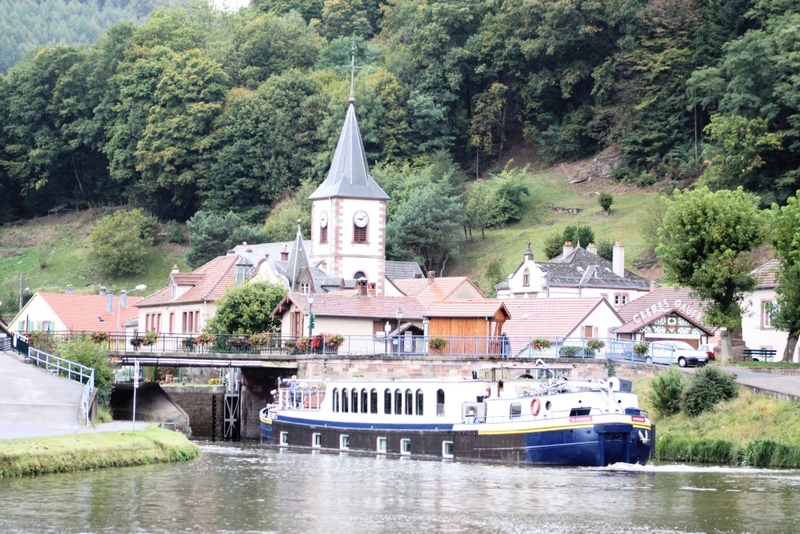 The canal de la Marne au Rhin (east) is absolutely fantastic with the very high wooded hills, quite windy sections of meandering canalised river and with many intriguing towns and villages along the way. The closer we came to Strasbourg the less French the region felt, and sounded as you can tell from some of the names of the towns above. Some reminded us of Alpine villages with peaked roofs, many small verandas and their use of timber. 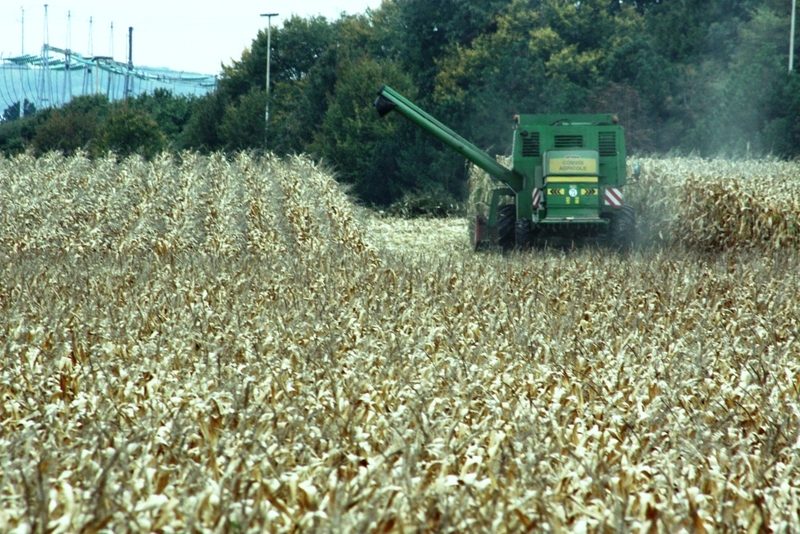 Harvesting continues .. this time maize. Not sure why this maize is dropped on the ground, beautiful colour. There were a huge amount of locks, naturally enough considering the hills we were navigating, but we found almost every one ready for us with the synchronised system (there was no remote control unit or rod to pull to signal the lock) and they functioned quickly and smoothly. 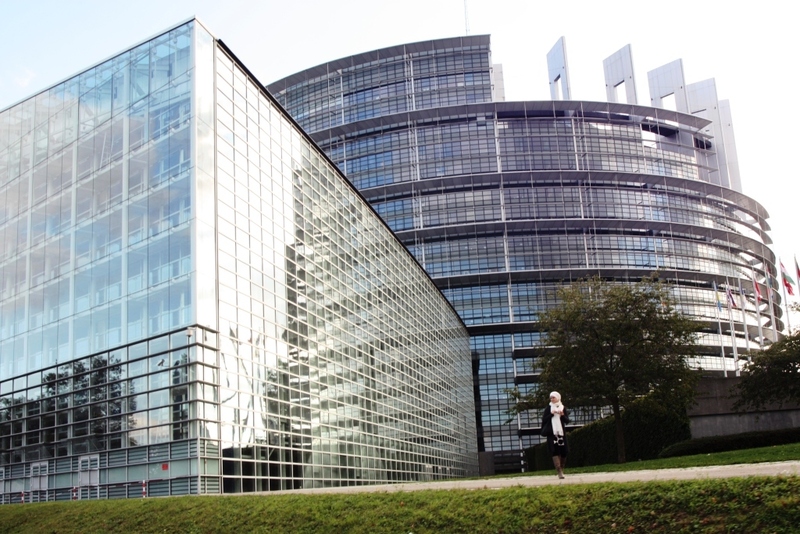 The final stretch into Strasbourg brought us past the “seat of the European Parliament”, a set of spectacular buildings. 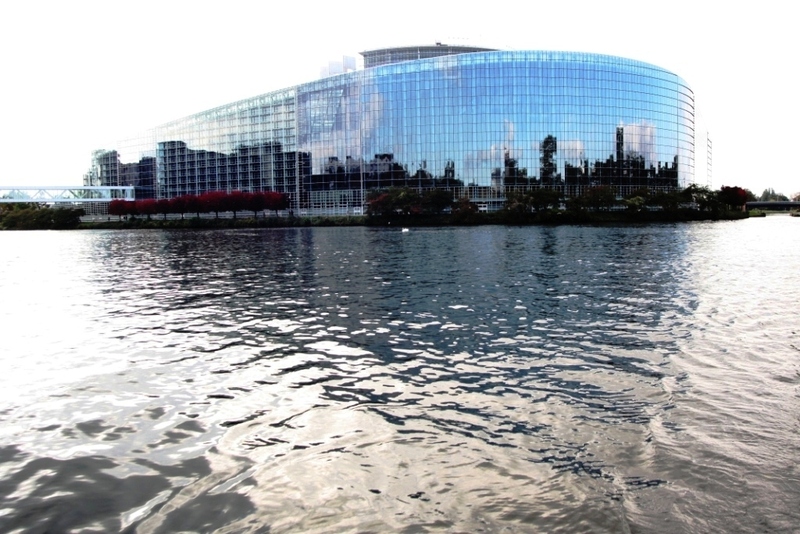 The stunning canal-side European parliament buildings. It is a bit confusing having visited Brussels this year to know the difference in roles between these cities, both boasting they are the centre of Europe so to speak. 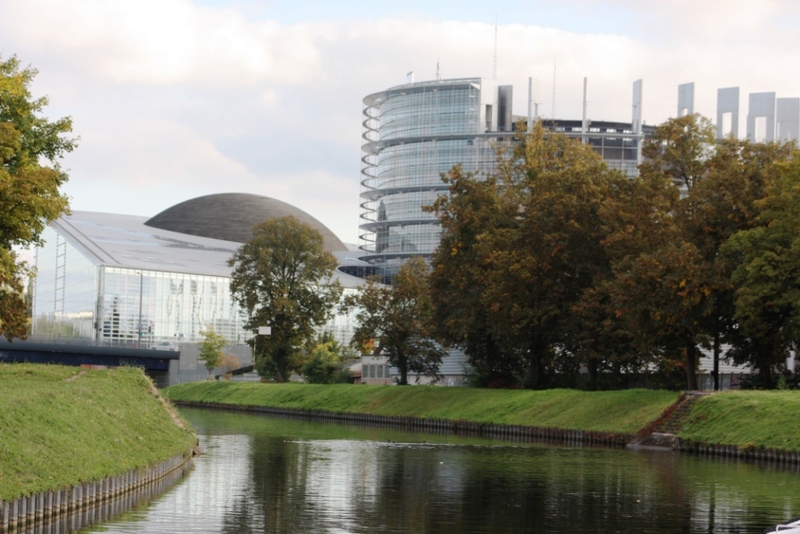 Reading some accounts we find the European Parliament has three places of work – Brussels (Belgium), Luxembourg and Strasbourg (France) – but the city of Strasbourg is the official seat of European Parliament. Legislation dictates they meet in Strasbourg twelve times a year, so Brussels seems to take a secondary position. · debating and adopting the EU’s budget, with the Council. European Council – The European Council brings together the heads of state or government of every EU country, the Commission President and the European Council President, who chairs the meetings held around four times a year to discuss the EU’s political priorities. Council of the EU – Also informally known as the EU Council, this is where national ministers from each EU country meet to adopt laws and coordinate policies. 3. Council of Europe – which is not an EU body at all. 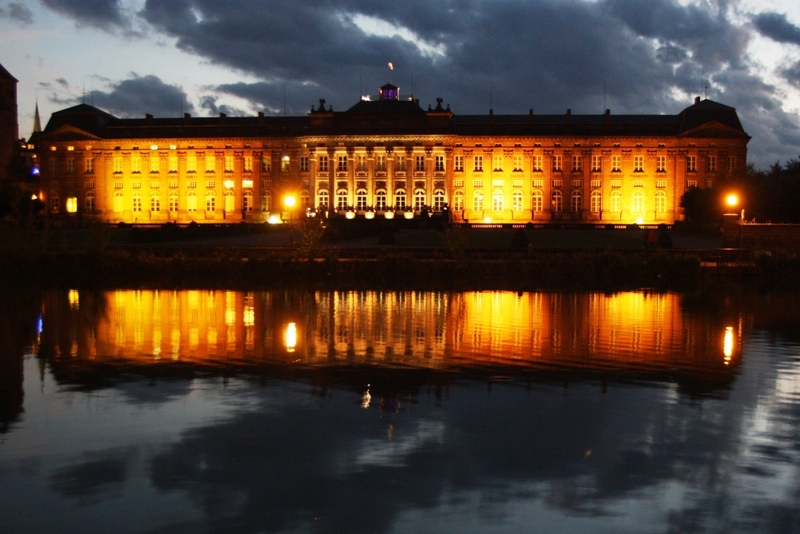 Parliament houses coming into Strasbourg. The Council of Europe has been based in Strasbourg since its foundation in 1949. It is founded on a concept first spoken of by Winston Churchill in a radio broadcast in 1943 and now covers virtually the entire European continent, with its 47 member countries (unlike the EU with 27 members, created in 1958). Here is their website. It keeps busy promoting co-operation between all countries of Europe in the areas of legal standards, human rights, democratic development, the rule of law and cultural co-operation. Note: no mention of common markets and global financial development. How confusing! If you want to explore this further the website for the Council of Europe (3 above) tries to address this with the heading: Do not get confused. Also good old Wikipedia has a section on this council: http://en.wikipedia.org/wiki/Council_of_Europe, with links and references to the EU and its councils! If this sounds like too many layers of government just think of all those there are in Australia. We were quite curious about the steel structure continuing around the main tower of the Parliamentary building (see photo). Was it a sculpture or unfinished work, we asked ourselves – then we found a beautifully conspiratorial websiteabout its design concept. Apparently it is based on the Tower of Babel, as in the painting by Pieter Brueghel the Elder (of 1563), a building fabled to be built to defy God, and never finished. All good fun, we can see how certain people could get themselves in a lather over this little bit of conspiracy. Parliament houses coming into Strasbourg, here you can see the unfinished look of the Louise Weiss building. We didn’t get to visit the vast complex of official buildings and didn’t feel sorry about it. They were great to observe as we glided by! We found it a little tricky finding a good mooring in the city, despite ringing the one suitable marina, Koejac Yachting, several times and being told “Oui, pas de Probleme”.. (Yes, no problem.. for you to moor). Finally after our third attempt to get a position that would take our 17 metres, AND was accessible for the wheelchair, we tied off stern end to the pontoon with lots of our boat hanging out in the canal. Looking across the city of Strasbourg, the cathedral and la Petite France area. No problem indeed, well they were completely happy with this if we weren’t. To our surprise we had absolutely no problems and ended up enjoying the mooring which was relatively close to the tram station and on the edge of a beautiful park. 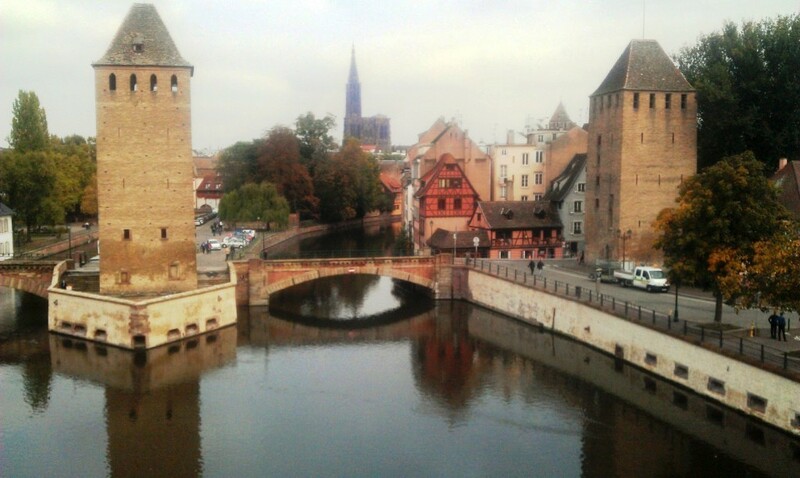 Strasbourg is an interesting city, as we mentioned in our last blog, although we felt happier and more relaxed in Nancy and that’s where we headed, back to meet with Ian and Pam. Loving great waterways of the world. 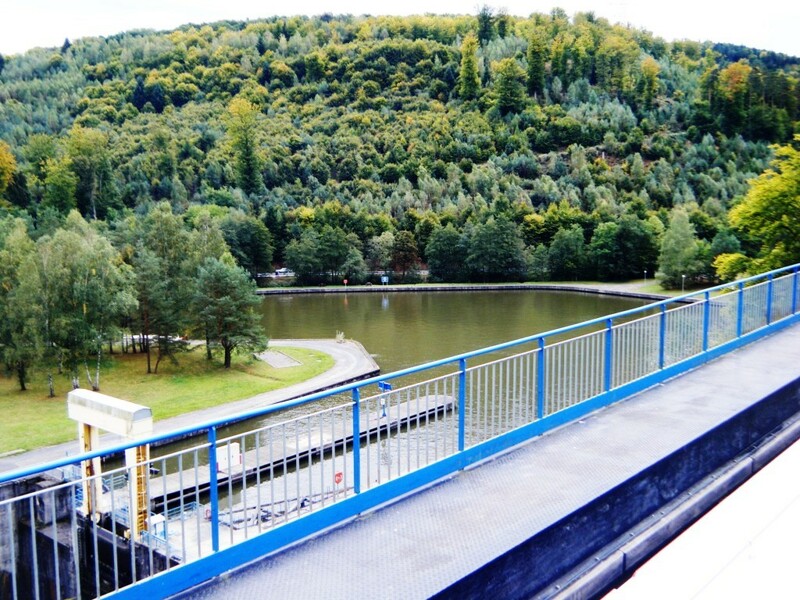 This entry was posted in Accessibility, Waterway life, Waterway services and tagged Boat services, Endellion barge, Facts and figures, Nancy, Restaurants, Ship repairs, Strasbourg, Wheelchair access. Bookmark the permalink.